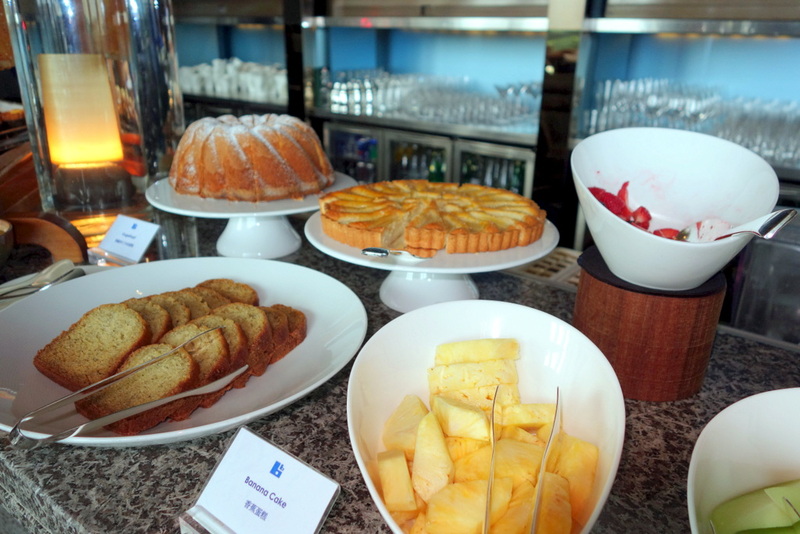 Buffet breakfasts are usually reserved for holidays – that sort of indulgence is just too tempting for a regular day. When I was younger, I could never seem to help myself when standing in front of a vast selection of food, where everything just looks so good, and you say to yourself, “well, I’ll just try a little bit of everything…”. One can never eat too much when wearing a tight dress! 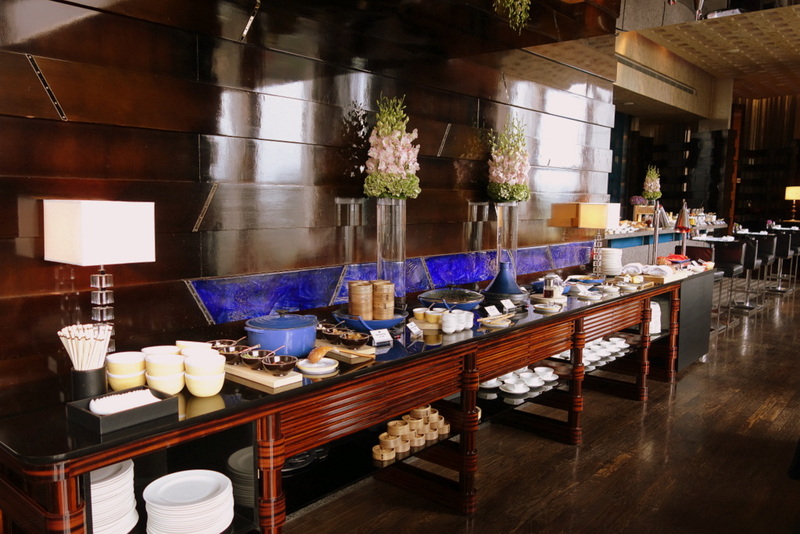 As a birthday treat for a friend who loves breakfast, I took her to the Blue Bar at the Four Seasons Hotel today for their breakfast buffet. 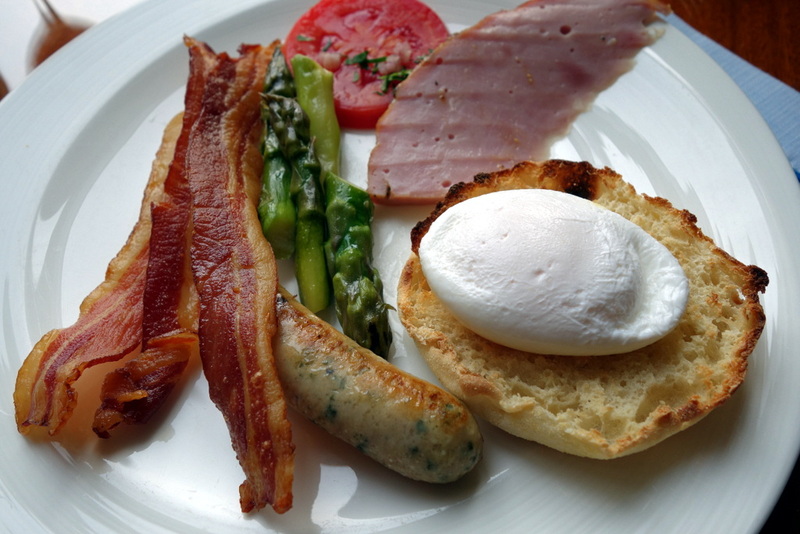 As I live in Hong Kong, I have not had the opportunity to try many breakfast buffets here, and thus cannot testify that it is better than any other. What I can say is that they have a limited but tasteful choice of hot and cold options, as well as a choice of freshly cooked eggs (scrambled, fried, boiled, poached, or an omelette), and coffee/tea is included. You can choose from a selection of Asian and Western foods – a self-serve congee station, prawn dumplings, and fried udon noodles. Or blueberry pancakes with vanilla cream and jam, crispy bacon and pork sausages (the cooked ham had a very funny taste and texture – not my cup of tea). Some cold cuts and smoked salmon with toast, baguette or English muffins. A selection of cereals, muesli and fruit. 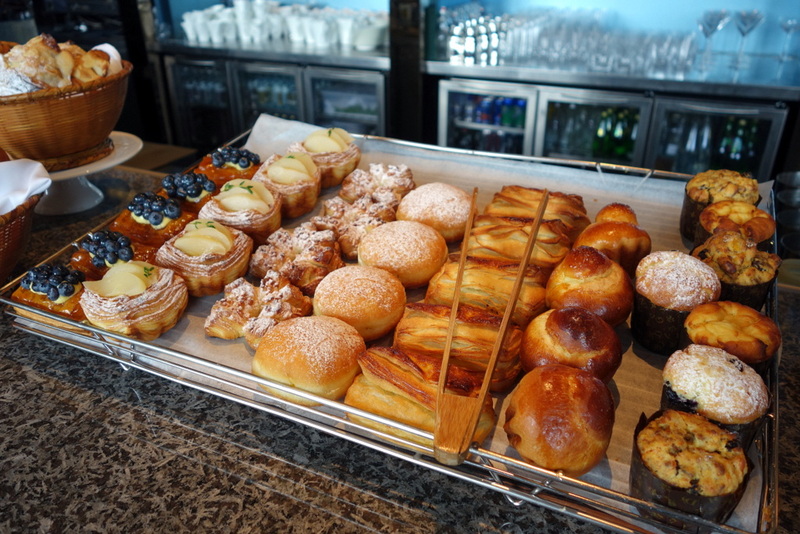 And the most glorious selection of pastries – I have never had such a carb-laden buffet breakfast! They were all so beautiful and I couldn’t help myself! The almond croissant was not as fluffy as I would have liked. It was not filled with frangipane as they sometimes are (and those are always my favorite), but it was covered in slivered almonds and dusted with icing sugar, making it a nice treat! I only had half of it to make room for the pear tart – the most beautiful pear tart I have tasted (which did have frangipane in it, yay! ), moist, not too sweet, with a crumbly pastry. 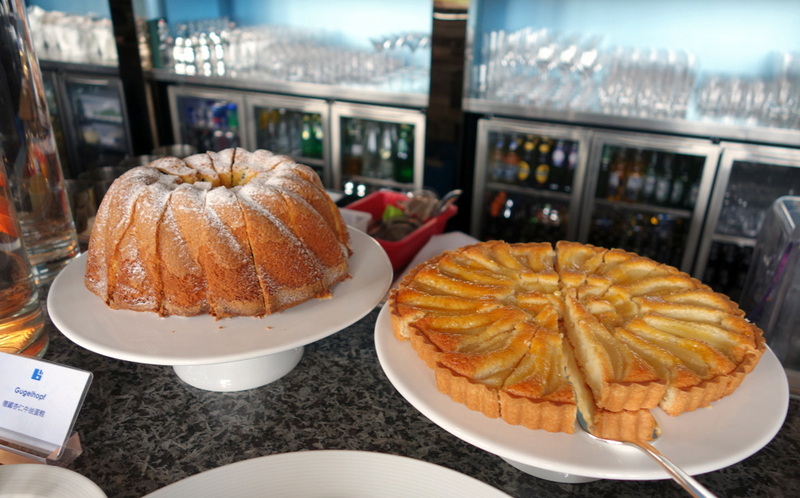 Also on offer was a Gugelhopf – a bundt shaped yeast cake traditionally containing raisins, almonds and cherry brandy, and usually enjoyed with coffee. One day, I’ll try to make it with this recipe. I do love the Blue Bar for their lunch buffet, as well as the cocktail snack bar in the evening, and their apple martinis (certainly the best in Hong Kong, if not the world! 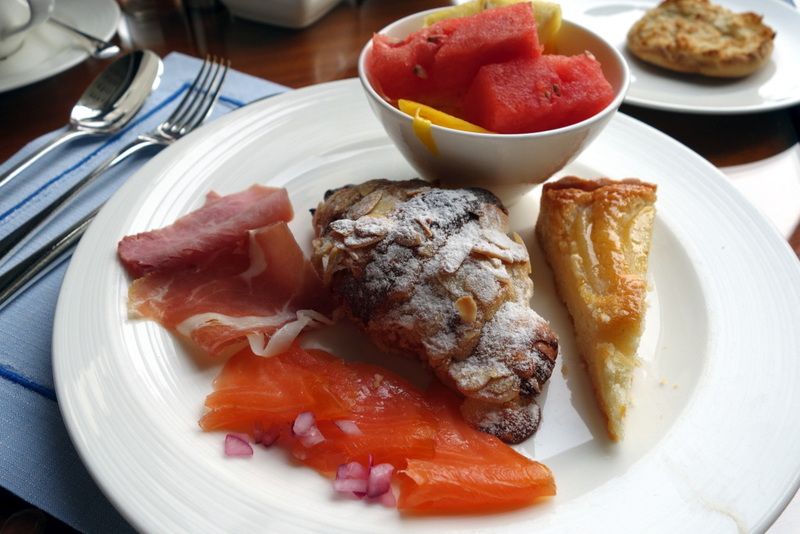 ), and I now can say that their breakfast is also enjoyable – even though I still prefer the lunch. 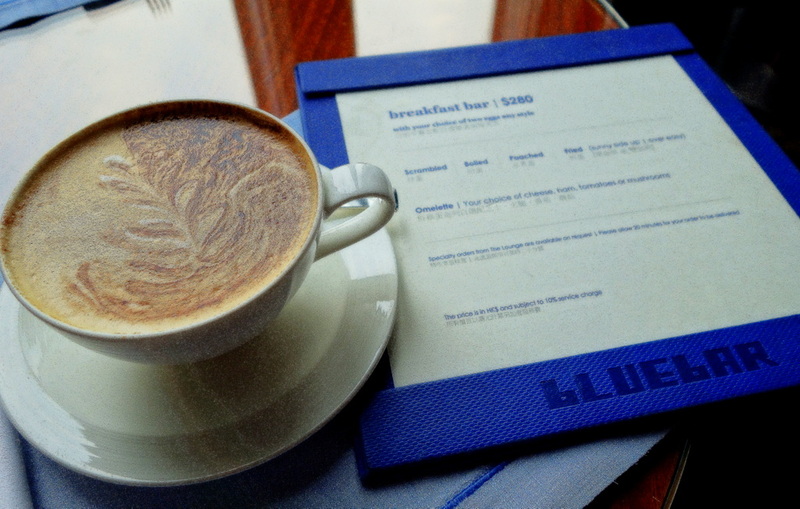 At HK$280, it’s not too bad at all, and certainly worth it for a special treat in the morning! I do feel ever so slightly guilty for skipping Bikini Fit this morning for it, but it was a special occasion, and to be honest it was nice to be greeted in the morning by a cappuccino and a bowl of fruit, instead of dead-lifts and burpees! After all, what is exercise for, if not to have balance in life to enjoy the finer (and tastier) things?